Join our exceptional team of Volunteers. Volunteers become our partners-in-care and reinforce our commitment to providing care and services that respect, support and enable our Residents; you play a key role in helping us remind Residents, each and every day that they are part of a larger community that cares. Complete and return the Volunteer Application Form. Applicants 18 years old and above must complete a Police Reference Check Vulnerable Sector Screening. 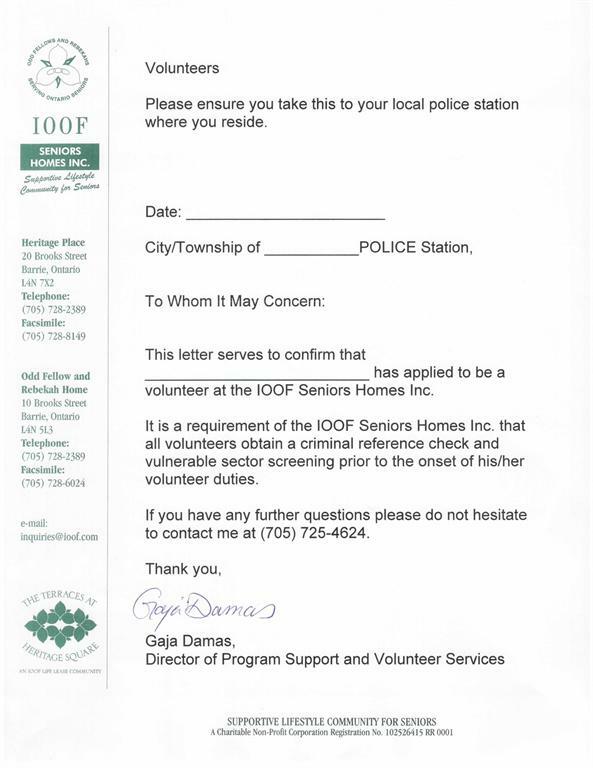 Please take the attached request for Volunteer Criminal Reference Check Letter to your local police station. Attend the next Volunteer Orientation Session. Upon receiving your application, The Director of Program Support & Volunteer Services will contact you to schedule you for the next Volunteer Orientation. Following Orientation attend a 1:1 placement interview to plan your schedule of volunteering.